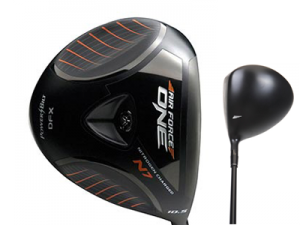 As I pointed out last year in my review of Powerbilt Golf’s AFO DFX driver, pumping up a clubhead with gas is not a gimmick though it would seem there are lots of players who as yet haven’t gotten the word. This patented idea is so good that, since the company’s first driver in 2008, Powerbilt makes a whole line of woods and irons filled with nitrogen under pressure. Plus, and this is totally irrelevant, “AFO–Air Force One” is a great name for a driver. So, since a nitrogen-charged driver is not just marketing department hype, why do it? The answer is straight forward. The pressurized gas supports the clubhead at impact allowing for a thinner clubface which in turn means more ball speed and as everyone knows that translates into more distance. 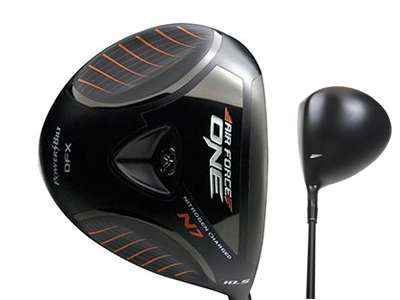 The new AFO DFX Tour driver looks identical to the previous MOI model with the major design difference being the center of gravity has been moved closer to the clubface helping to create better launch conditions with lower ball spin. Powerbilt accomplished this CG move very practically by simply placing the valve used to charge the head with gas forward a fraction of an inch. The view at address makes it easy to square the clubhead to the intended line and as with the previous model the sound at impact is still distinctive, not annoying but different than the two best-selling drivers. Feel is one of the best features of the AFO Tour…very solid when contact is made on the sweet spot and acceptable when the hit is not exactly dead center. Trajectory off the 10.5 degree loft head was medium high and carry distance was as good as any driver tested this year (in Florida, in the summer, there’s not much roll so carry is all you get). The Fujikura Pro 63 stiff shaft was correct for my swing speed and because the AFO DFX Tour produced a low amount of side spin it was very good in crosswinds. There’s no doubt this is a “better player” driver since, though it is forgiving, an off center hit can definitely be felt. Because of the inherent advantages of the design my typical mishit, which is towards the toe, usually resulted in no more than about 10-yards loss of distance. Higher swing speed players should have similar results though of course the carry distance will be greater. Negatives: As mentioned the forgiveness for mishits makes the Tour model a choice for those players who usually hit the ball on or near the center of the clubface and probably have higher (over 90 mph probably) swing speeds. 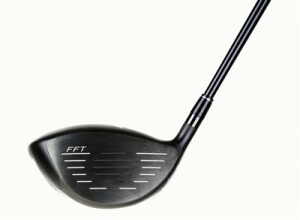 Unlike most drivers on the market the AFO DFX Tour is not adjustable. Recommendation: If you are capable of producing a better than average swing speed the Powerbilt AFO DFX Tour is one that should be considered–distance is good and at $300 (which is $200 less than some top of the line models) it provides very good overall performance.